Description: The staminate (male) flower heads are clustered at the tips of short flower spikes, and the pistillate (female) flower heads are clustered below them. 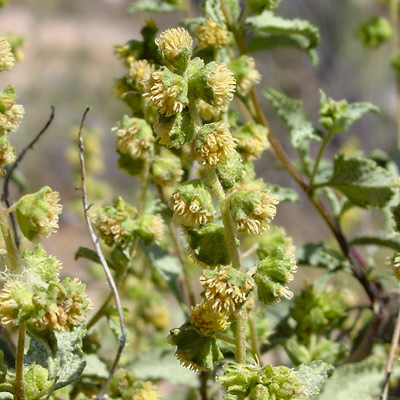 The flowers are wind-pollinated and are followed by spiny burs. The leaves have toothed margins and are hairy, petiolate, mostly alternate, gray-green in color, triangular in shape, and up to 1 3/4 inches (4.4 cm) long. 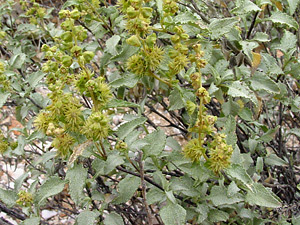 The stems are upright, hairy, and brownish to green in color.